If you're seeing this on our Typepad blog, we invite you to head on over to our new blog at www.simplestories.com to join us for our Spring Release Week and National Scrapbook Day Celebration! Today we're revealing a fabulous new summer collection - Good Day Sunshine! Come join the party and enter to win a prize package before you can buy it! We'll be showcasing a new release each day this week followed by a fabulous National Scrapbook Day celebration on Saturday, so come on over! P.S. - we've heard from many of you that you miss the email notifications with our new blog - we're working to get that fixed and will keep you posted soon! Hello All! Alissa here today with another week of my life documented! Yay!!! The Simple Stories collections make it so easy to get these weeks done! Weeks from the middle of 2013, even. :) Today, I've got one of the new collections from the 2014 Winter CHA show, A Charmed Life. I LOVE the greens, blues and yellows of this line. It's not only for spring and St Patrick's Day. I love it for everyday! It's such a pretty collection. I used 2 different designs of the 12x12 Pocket Pages (Design 3 and Design 5) and 2 different designs of the 6x8 Pocket Pages (6x8 & 3x4/4x6) as a 3 page insert. I LOVE adding inserts! Too much, sometimes, i think. I'm moving into my 3rd 12x12 album for 2013 and I'm sure I will need 3 for 2014. Darn inserts! HAHA. All the die cuts in the Bits & Pieces packs are perfect for Life Documented scrapping. There are lots of little labels and tags to add to photos and cards. PERFECT! I think the Happy and Lucky cards are my favorites in the whole collection! Here's insert page number 1. I added in all the extra photos from the week in a 6x8 pocket from the SN@P! Pockets pack and journaled about the week on the front. Just slip it in a 6x8 Pocket Page and you're good to go. This was the week I took a bunch of photos of my team at work, on the green wall (I LOVE that green wall!) and included them all in a couple of the 3x4/4x6 Pocket Pages. What an awesome way to add in a bunch of extra photos each week. See? Inserts. I love them! Simple Stories makes it SO EASY to add inserts! Here are a few close ups of my spread pages. A chipboard arrow, a few stickers and a date stamp turn one of the 4x6 cards from from the Horizontal Journaling Card Elements set into a weekly title card. I always LOVE the Simple Stories brads, too. Especially these from the A Charmed Life collection. I know it's a lot of photos, but I wanted to share it all with you. This collection is so awesome and is perfect for so much more than just St Patrick's Day! I'm using the 12x12 SN@P! Faux Leather album in Teal for my Life Documented spreads. I just love these albums. They are super sturdy and the teal color is fabulous! Also, here are the Pocket Pages I used in the spread. There you have it! A Charmed Life documenting a late summer week of everyday stuff. Perfect! This line is so much more versatile than the first glance might just offer! What will you create with A Charmed Life? Hi! My name is Amber Boren. I grew up in California, but now live in sunny Arizona with my husband and four children. Yes, I love warm weather!! Life is so precious. That is why I believe we should document all the wonderful moments, and everything in between. Life goes by way too fast. 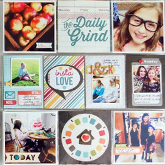 I ran across Amber's gallery at scrapbook.com and loved how she uses our collections in her projects! You'll notice that Amber has photos of teens and boys are her layouts - A Charmed Life is not only a great springy collection, but it works great for older kids AND boys as well! Thanks so much Amber for sharing your work with us this month! Life Documented with Summer Sn@p Set ! It's Mindi here and I am super excited to share with you today a Pocket Page using the Summer Sn@p Set. I used a Page maps sketch as a starting point in making my Beach day layout. The first thing I did for my title card was cut out the middle of the doilie from the Homespun Collection. Now it was ready for the title, the date and then the patterned paper on the bottom. I am in love with the honeycomb paper on one of the Summer Sn@p Cards. I cut up the paper to make a great patterned for the top of the title card. I did some more hand cutting up the Sn@p cards again and made some waves for this journaling card. The clothes line banner from the Squares and Pieces Summer Sn@p Set was a perfect fit to embellish this card. The other side of my 2 page spread came together super easy with these fun pocket page. I love to use big photos in my layouts. They can make a big impact to the overall look. This pocket page was perfect to house my big photo. To add to my photo I decided to use one of the new DIY Clear Photo Overlays. I made a clear frame with a slick writer and added some pieces from the Summer Sn@p Squares and Pieces. I needed to add some type of journaling card to my Pocket Page. This one was perfect and super fast because it was already mostly embellished. I will be using the Teal Sn@ap Faux Leather Album for my Life Documented pages. It is so durable and looks great ! Thank you so much for letting me share my pages with you today ! Angella here today with a spash of Colour using the new Summer Paradise simple set for a SUMMER mini album ! for some of you out there, i promise the hot weather is coming. I loved Summer paradise as soon as i saw it ! The Colours are great for those summer projects and best of all it is a FUN collection! I have created a mini album using a chipboard beach pail album, and the summer paradise 12x12 simple set. the summer paradise collection comes complete to create great projects. 3 . to create the funky classes as i have, the classes are cut from the Elements 1 1#6034 page, then i just dressed them! 4. 3d foam the front cover and another page together, this is so you can add elements to your bucket - example straws, cardstock stickers. I have also used the DIY Enamel dots and Burlap stickers - arrows for that added extra Zing ! Hi everyone, so glad to be back with you today! Wendy here to inspire you to get even more use out of those wonderful Insta Square pieces from the Homespun line. As I was looking through the pack of Insta Squares I was thrilled with all of the colors and designs and knew that I wanted to create a page to showcase these beauties. I began by choosing my favorite pieces and arranging them in a grid using the navy dot as my background to really make them pop. I could have easily stopped there and even framed the piece as it was so pretty to look at! But I had the perfect pictures to showcase on my background. After adding my picture of my son and his furry friend I began to add different items to the squares to dress them up. And that is all it took! Wow, I am totally in love with these Insta Squares! I created my next layout using a grid design also and the Sn@p! Birthday cards to celebrate my son's 3rd birthday. I decided to go with the teal and red color cards as my base along with the 3 favorite things card as my son was turning 3. I again chose a navy background to make my cards pop, but this time to add a fun feel to my layout I tilted my design and used a bright yellow for more of a kick. This time my grid wasn't exact, but it gave me a quick place to start from. I again embellished the different cards using the pieces included with the Insta Squares and the Sn@p! stickers. Since I had quite a few pictures from the various events of our little guys birthday I decided to showcase my favorite that really shows his personality and then using some cardstock which I folded in accordian style I included the rest of the pictures, tying them up in a neat little package. I don't always use a grid design, but with such great products at your fingertips it makes the grid a great tool for your scrapbooking! Join me at my blog for another look at a grid layout using the Sn@p! Everyday set. See you next month!